Jonathan Rea was second fastest on Friday in free practice at Aragon in Spain. 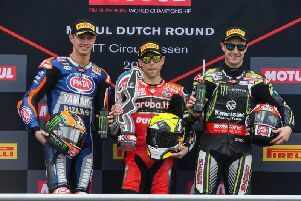 Jonathan Rea made a strong start to the third round of the World Superbike Champion after posting the second fastest time at Aragon on Friday. The reigning champion led the way in FP1 before Ducati’s Marco Melandri hit the top in the second free practice session, ending the day quickest overall by only 0.039 seconds. Rea leads the Italian in the points standings by two points after the first rounds in Australia and Thailand. Mixed weather conditions made it a difficult day in Spain, with rain affecting FP1 and FP3. However, Rea was satisfied overall after making further progress with the Ninja ZX-10RR following the introduction of new technical regulations this year, which have reduced the maximum revs allowable. “It was a really difficult first day because of the weather. We arrived here for the first session with the gearbox so far out and I was in between gears in all these second gear corners, which are so important or a good lap time here,” said Rea. “We tried to find a good compromise in the gearing and in the second session it started to feel a bit better. “The difference between all the tyre options that Pirelli has brought here is quite large. The tyres are the standard SC1, the development SC1 and then the standard SC0 race tyre and the difference between them is large. So it may be difficult tomorrow because we have not had a lot of time to set the bike up and do a race simulation - but I feel quite good with the bike anyway,” he added. Rea’s team-mate, Tom Sykes, was third fastest followed by Chaz Davies (Ducati), Jordi Torres (MV Agusta) and Alex Lowes on the PATA Yamaha. FP4 and Superpole qualifying takes place on Saturday before the first race at 12:00 BST, with race two schedule for the same time on Sunday. In the World Supersport Championship, Carrick’s Andrew Irwin was 28th on the combined FP1 and FP2 times on the CIA Landlord Insurance Honda. Irwin, who is riding at Aragon for the first time, is still feeling some discomfort from a hand injury he suffered during the Phillip Island test, which ruled him out of the Australian round in February.